SKU: 27460 Laguna 27463 Main. Categories: Occasional Tables, Standard. Tag: 27460. • The Cocktail Table features a top frame of inset slate tiles with a center panel of 5mm bronze tinted glass with beveled edges. 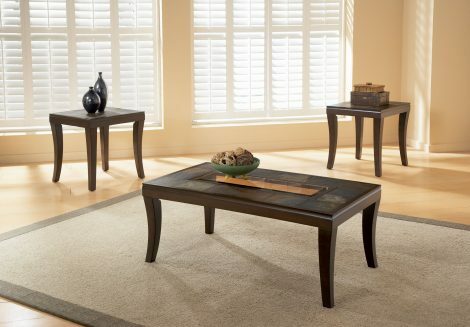 • Rectangle End Tables have inset slate tile tops for easy care surfaces. • Construction materials include birch veneers, poplar solids and quality wood products. • Laguna tables are finished in a dark merlot stain with a subtle sheen quality. • Multi-toned slate tiles add complimentary shades of grey, sienna and ochre to highlight the rich wood color.